"View Image Button for Google Images" extension brings back the 'View Image' button to Google Images. The extension supports both desktop and mobile versions of Google Images. Also unlike many similar add-ons, it can detect the correct image when images are slipped in the UI. This extension supports re-implementing the button in all localized versions of Google Images. Read the FAQs part to figure out how it supports the localized webpages. What is the "View Image Button for Google Images" extension and how does it work? Google decided to remove the "View Images" button from its Google Images website a few months ago. This extension brings the button back. It basically provides an easier way to access the image sources without the need to visit the destination website just to get the image link. Furthermore, sometimes getting the image from the original website is really tricky! The extension adds the button to the UI similar to the other add-ons for the same purpose. I developed this add-on since I found some technical issues with all other similar add-ons. First adding a simple button to a webpage should not require persistent background script. Second, adding a button should not be dependent on installing a mutation observer. Basically, when a mutation observer is installed on a webpage, a function gets called for each and every element that is injected into the UI. This technique although works, it is not recommended as it can reduce the page loading time. Anyways in my implementation, there is no mutation observer and the extension works on the mobile view too. So you can install the extension on mobile devices as well. Can I use this extension on my mobile device too? 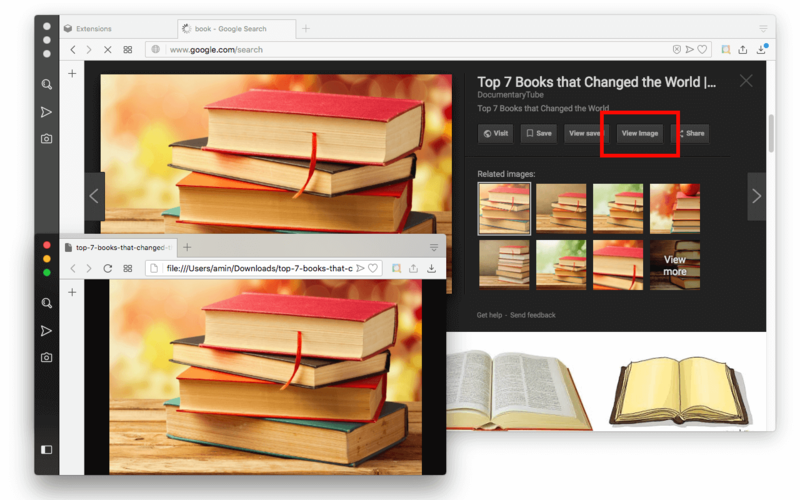 YYes, this extension can re-implement the "View Image" button into both desktop and mobile version of Google Images. So if you are using a mobile browser that supports web-extension, you can install this add-on. Similar to the desktop version you will get a button before the share button just below the actual image. Why this extension need permission for all hostnames when it only interacts with Google Images website? Google uses localized domain names like google.ca for Canadian users for instance. To implement the button on all the localized Google Images websites, the extension needs to have access to all hostnames (it is literally no way to find all the localized Google domains! they are just too many and Google adds new ones too). Anyway, the extension uses a filter in the manifest to inject the script only to the Google Images pages. So this extension does not interact with any other page at all. Check the GitHub page and browse the manifest.json file for more info about how the actual script is being injected. This website is a free web hosting service. The content of each page is provided by the individual developer(s), not this web hosting service. add0n.com does not monitor the user contents, however, we do monitor and review the quality of the web pages hosted by our server as well as the quality and performance of the products that are presented by this hosting. Copyright © 2008-2019 add0n.com. All Rights Reserved.